Corporate retreat coming up? Here are 3 key questions to answer there. It’s that time of year when a business will gather its management team together and head to a secluded location somewhere in the woods or at the beach for their annual corporate retreat – to talk about and make plans for the future of their firm. 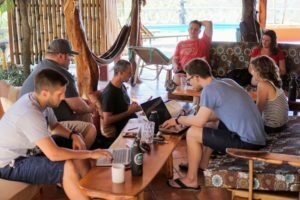 I am a HUGE fan of the idea (even doing it when I was a solopreneur: http://www.harpethmarketing.com/competitive-advantage/corporate-retreat-part-1/). In fact, we had this year’s corporate retreat just last week… and I have the pages and pages of flip chart notes to prove it! Take some time to brainstorm about this. Consider what your competitors are doing and what you’re learning about from vendors, at conferences and online. Who are we selling to? Do you have a target market (or markets)? Are there other markets – perhaps related to who you work with now – that you might want to consider (e.g. if you currently work with hospitals, should you also be working with health insurance companies)?” Talk about this amongst the group. Are there brand-new markets that represent an opportunity and are, at least, worth exploring? Discuss this at the retreat. Are there trends in the markets you serve that might impact your firm, positively or negatively? Put this on the agenda, as well. How do we market our business? Once you’ve agreed on what you’ll be selling (even if it hasn’t changed from the current year)… and then agreed on who you’ll be selling to (even if it hasn’t changed from the current year)… then it’s time to make sure that your marketing and sales efforts support them. What’s our Position or Point of Differentiation in the marketplace? What do we want to be known for? And what’s our messaging related to that? How are we building awareness across the markets we serve? How are we generating a steady in-flow of sales leads? And how can we nurture those leads until they’re ready to buy from us? What can we do to convince a sales prospect to ‘try us’ for the very first time? What do we do – in addition to a ‘good job’ – that keeps those new clients coming back again and again? A well-run and well-managed corporate retreat can be a real catalyst for the future growth and development of your firm. So, go into it excited and prepared to tackle the tough questions. And while you’re at it… don’t forget to have a little fun, too!